What is the One Bag Challenge? The one bag challenge is one of the simplest ways to help reduce trash and save land. If we reduce trash...you guessed it...there are less landfills and more space for parks to walk and to play in! The idea is to get your family, your classroom or your office down to one bag of trash every week. The Green Gang at Planetpals is always trying to think of better ways to help earth and make your world a better place to live in. We are pleased to announce the ONE BAG CHALLENGE! Lets see if we can exceed our goal this year! JUST Pass challenge a friend, by sending this to them! Just How Can You Do That? 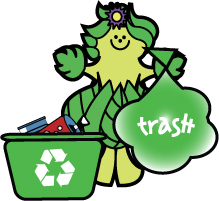 Planetpals One Bag Challenge is challenging you to make a list of ways you can reduce and reuse that trash so that it doesn't go into the wrong BIN. 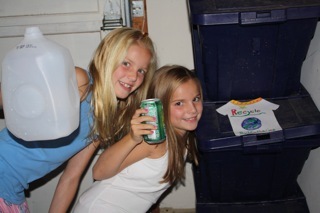 Planetpals wants every family, classroom and office to try really hard to get down to ONE TRASH BAG a week... at least! Need more ideas? Check out the Earthday Everyday Pages on Planetpals. We Want Everyone to be a Planetpal! How do you reduce trash? Its sounds complicated, but it's simple. Know before you throw! Think about every item before you toss it in that trash bin. Can you make something out of it? Can you put it on the CURB with a FREE sign? 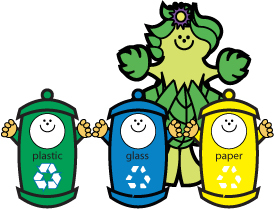 You might find that simple things such as the cardboard rolls from paper towels can be flattened and put in the RECYCLE bin! Packages can be folded up and put in the RECYCLE bin, too! Let us know how you did it! We just might tell all our Pals your story! o Celebrate Earthday Everyday visit Planetpals greatest earthday pages ever! © PLANETPALS.com: The best place on EARTH to Learn about EARTH! Listen to Planetpals Theme SONG!